I don't have any kids (unless you count my dog), so I wouldn't consider myself an expert on children's books by any means. That being said, I came across B.J. Novak's The Book With No Pictures recently and was so impressed by it that I had to write a review. Novak is probably best known for his role on the hit comedy The Office. In The Book With No Pictures, he uses his comedic abilities to create a bedtime story that both kids and parents are sure to enjoy. 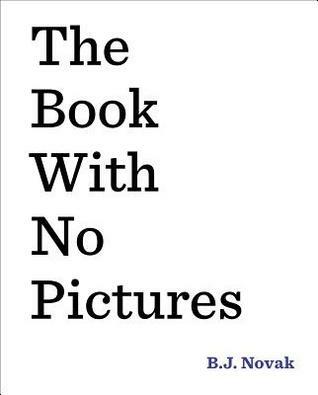 As you probably guessed by the title, this children's book has no pictures. Instead, the book relies on the simple premise that whoever reads the book aloud is bound to say every word that is written...even if that word is something as silly as "Blork!" This soon creates a conflict as the reader does their best to avoid the crazy words, but they are bound by the rules to read them. There's nonsensical words, silly phrases, and even a song. I really admire what Novak has done with this book. He breaks the fourth wall and creates a story that both kids and adults will get a kick out of. The publisher recommends the book for kids aged 4-8, but I imagine this could be enjoyed by kids who are a little younger. The book's premise truly allows for the reader to get creative in their delivery, allowing for endless variety from read to read. 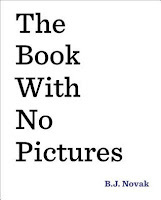 The Book With No Pictures is a unique offering in the crowded genre of children's books that is sure to inspire a life long love of reading in every household that it reaches. This entry was posted on Tuesday, August 30, 2016 and is filed under B.J. Novak,Book Review,Children's Book,The Book With No Pictures. You can follow any responses to this entry through the RSS 2.0. You can leave a response. Oh this sounds fun Ethan, I will keep it in mind for my grandbabies.